In a large stockpot, add the water and bacon and bring to a boil. Add the collard greens by handfuls, stirring until each batch is wilted before adding more. Bring to a boil and add the onions. Cover and simmer over moderate heat until the collards are very tender, about 40 minutes. Remove from the heat and let cool, then squeeze the collards almost dry and coarsely chop them. Meanwhile, in a food processor, combine the dry bread crumbs with the Parmesan cheese, minced parsley, sage, garlic and extra-virgin olive oil. Pulse until just blended. Preheat the oven to 350°. Generously butter a shallow 4-quart casserole. In a large bowl, mix the collards with the cream and season with salt and pepper. Stir in the eggs until blended and spread the collards in the prepared casserole. Cover with foil and bake for 30 minutes. 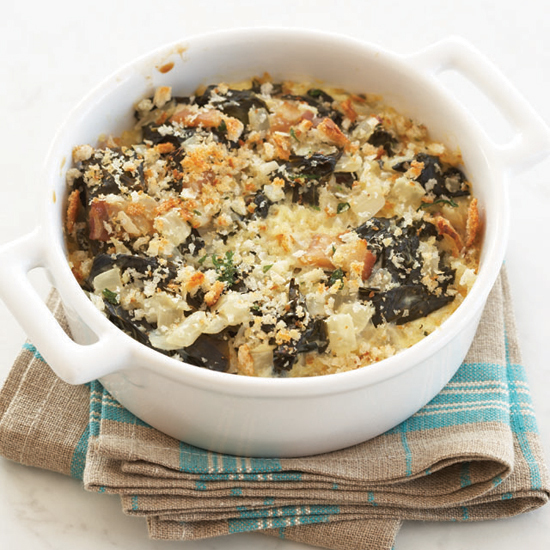 Sprinkle the Parmesan crumbs over the collards and bake for about 20 minutes longer, or until the crumb topping is golden. Preheat the broiler and broil the collards 10 inches from the heat until the bread crumb topping is golden brown and crisp. Serve hot. The recipe can be prepared through Step 3 and refrigerated overnight. Bring to room temperature before proceeding.